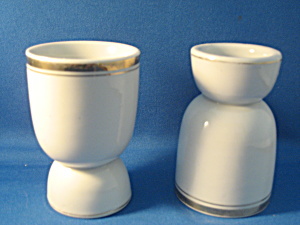 This wonderful pair of egg cups are called Double Egg Cups. This means the person serves the soft boiled egg in the smaller section and the person eating the egg will flip over the cup and crack the egg and put in the larger end to eat the egg. These two are trimmed with gold and was made in Germany. Both are in excellent condition.